Ok so I made my pond last September and the fish did ok in winter but now that it's hot out i can tell in fish behavior in having some issues. I have about 1200 gallons, one large koi and 8 small ones ( ya I know too much ) .I have noticed them flashing jumping and twitching fin so today I dosed with 4oz of microbe lift broad spectrum disease treatment and also tested my water so my question is what am I doing wrong with my pond . Also I've got 2 UV pumps 13w running and they have a sponge on top of it so it collects stuff .I don't have a fancy bottom drain or anything but I'm sure people can keep koi without it ? pH 8 .5-9 ish . Really deep blue on the API drops kit..
What do you have for filtration? How much are you feeding? You will need a mechanical filter to take out the debris, waste, etc. You will also need some biological filtration to house good bacteria also. Having 9 koi in 1200 gallons is probably over taxing your filter system already. Koi are big waste producers, and without proper filtration, you will have to cut your stock way down. That’s probably what you didn’t want to hear. Without a place for the bacteria to colonize, adding any beneficial bacteria does nothing to help with the conversion of the ammonia that is produced by the koi. With those filters and 9 koi, you are very seriously under filtered. Both of those running might work with a couple small goldfish in your pond. I would suspect that they are irritated by the amount of ammonia in the water. Daily water changes of 10-20% might help for now, (must dechlorinate water) , and cut back feeding, but your system is not even close to adequate and the koi will suffer as a result. Check out the library on the forum to look for filtration ideas. Many can be built DIY instead of bought to save money. Side note... don't worry about phosphate. There's little you can do about whatever the number is. Your pH reading sounds like you may have the "wide range" test. A much more accurate one is the "high range"
pH test that API sells which is more in tune to what we normally see in our ponds. Do you have rocks in the bottom of the pond? Like has been said, no food until your pond can try and catch up with ammonia and nitrite. I do not have any rocks at the bottom , I didn't even think of adding those ..I know people add for aquariums.. you think rocks would be a benefit for me ?? Sorry, no. Rocks on a koi pond bottom is a disaster imo. Just checking. No, do not add any rocks. The sponge you mentioned, is it just attached to the pumps? If so that is to prevent the pumps from getting clogged by debris, and they are too small to perform any filtration. It sounds like you have no filtration at all. For your size pond, the ideal would be no more than 3 koi, so you are overloaded. It is not something that can not be worked with, but it makes it much harder and takes more diligence. Koi will grow to be on average about 2 foot, with some growing upwards of 3 feet, so you can start to see how big your pond needs to ultimately be. Most of us didn't start with the right size of pond and ended up building at least the third pond. Look at the Sand Gravel filter. It is relatively easy to make, easy to maintain, and will come closer to providing the filtration that you need, for now. It is also possible that as the fish grow you can add a second or third to get more capacity without throwing out what you have. The problem with the sponge type filter, there is very little bio filtration provided, except in the sponge and it has to be removed periodically for cleaning which destroys some of that precious bio colony needed to keep the ammonia at zero. With the "flashing jumping and twitching fin" the cause can be water quality, primarily burning type irritation from ammonia primarily, but it could also be a result of parasites. I would attempt to get the ammonia down, requires increased filtration, or longer time to cycle, and/or reduced feeding. The fish will not starve to death if left unfed for a couple of weeks to improve the water quality. Once the filters cycle, then feeding can resume. If the issue is parasites irritating the fish the Broad Spectrum is probably as good as it gets for taking care of most parasites. It does not take care of flukes which require Prazi or Fluke-M. Prazi is hard to wet, so it needs to be mixed with some of the Broad Spectrum as a wetting agent. Usually use it with the third dose of the Broad Spectrum. Welcome to the crazy world of koi. Stick around and read, ask questions, and one day you will have your third pond, maybe as your second pond. Lots of help here. The bad thing about that type of filter is you have to lift the filter parts out to clean them. Look at doing a biofilter outside the pond. My biofilter is a 150 gallon cattle trough. You just need to run the pond water on the outside of the pond thru filter medium that builds good bacteria and then back into the pond. The bacterias turn ammonia to nitrite and nitrite to nitrate. I have bio balls and floor buffer pads in it, it has a bottom drain so i can back flush it every couple days. 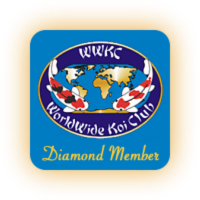 sign up at www.koiorganisationinternational.org Its free and then download the KOI 101 course/booklet. Has good information. Also we have a DIY section here at koiphen on building filters. A small plastic outdoor garbage can will work. Ok thanks I will look into building a trashcan filter ,lol. Another hint about cleaning the filters: Rinse them in pond water only. Don't clean them with chlorinated water, like in the garage sink. Those sponges will house a ton-o bacteria if they're not completely cleaned and rinsed with the hose or in a sink. Dunk and gently rinse them in pond water in a bucket or a tub. And don't scrub the sides of the pond to clean it either. Lots of bacteria slime will grow there too, and maybe even some algae that thrives on ammonia. I am far from an expert, but I have very similar setup to yours so I can tell you what I do. I also have a 1200 gallon pond running 2 of the exact same submersible filters that you do but with only 4 small koi and some goldfish. Under the sponge there are three boxes filled with different sizes of bio filtration. I clean my filters once a week so with your fish load you will probably need to do it more often. I also do a 50% water change every week and occasional 10% changes when I have time in the evening. Also I can tell you that those pumps are advertised at 660gph but run closer to 400gph in my experience. They also sit up off the bottom of the pond so you have to manually clean there. They are also a pain to lift out of the pond and clean so I will be tearing up the pond, expanding it, and putting in a bottom drain and external filtration in the fall. If you have a waterfall you could add some bio filtration there too. I would also add some air stones to help oxygenate the pond. Again, I'm a beginner like you but that is what has worked for me for the past year and a half in a similar setup. Yes I hate taking them out to clean them .breaks my back and I'm sweating like a pig ..lol. I was looking into getting the little external filters almost like a pool filter that sit upright like a tank. I do have plants in the pond which some people have told me is good and bad so I don't know what to believe as far as plants.i do try to trim the dying parts of the plants so they don't go in the water . Did you ever get a KH kit? That number would be helpful to know also, especially with the overall health of your biofilter. I have a few weird filter setups too. One is called a pressure filter, I call it a garbage an filter, and they're relatively easy to set up and maintain. I also have an OASE Biotec 10,000(?) - I bought it for $100 from a member on here. That was really easy to set up and use too. Just simple gravity filters. The are many on our DIY page to help you get started, and to save money. You can make them out of virtually anything. And the sand gravel filter is considered on of the best and easy filters to use and clean. Standing up!!! I havenone partially assembled in my garage, just never finished setting it up. Hoping to this summer. We're always trying to improve on what we have!!! I love my little pond. 1500 Gallons. Get the water quality right and the fish will take care of itself. Pay particular attention to KH and pond covering to maintain a fairly stable PH. This is specially true in a small pond. Feed little as a beginner. .no I didn't get a KH kit. Have spent a little too much this paycheck haha..
Last edited by littlefishgal; 05-16-2018 at 10:00 PM.